After teasing a big announcement for next week, Shamrock FC returned to the cozy confines of the Lumiere Casino for Shamrock 292. Headlining the card this evening were two dynamic strikers in Cort Wahle and Trevor Ward. Wahle came in aiming for his second win in a row to keep his resurgence going strong, while Ward was looking to get back in the win column and right the ship. While the striking was the story coming into the bout, Trevor Ward had other plans and shot an immediate takedown after touching gloves with Wahle. Wahle remained active off of his back, constantly looking to attack with submission attempts. Ward landed a few strikes, but Wahle was able to reverse position and end up on top. Ward quickly threw up a triangle attempt in the transition, and after trying to escape, Wahle was caught in the position and tapped out, earning Trevor Ward the first round submission victory. Ward snaps a three fight skid and improves to 6-4. In the co-main event, it was Finney's MMA wrestling coach Ryan Sutton taking on William Vincent in a light heavyweight match-up. after landing a solid cross/hook combination, Sutton pressed Vincent into the cage to grind him down. Once there became a moment of separation, Vincent threw a kick that Sutton caught and used to secure an easy takedown. Sutton then landed elbows on Vincent while in side control, when Vincent scrambled back to guard, Sutton remained heavy in position throwing big strikes from the top. Sutton then stood up and let the fight come back to the feet. Just before the bell, Sutton took Vincent down one last time as the round came to a close. Vincent started the second round grabbing a clinch on Sutton, which Sutton quickly used to press him toward the cage and get another takedown. Vincent was able to stand back up, and threw a knee that landed to the groin of Sutton, echoing through the crowd, and causing a stoppage to the action. The strike landed hard enough that the five minute recovery time provided was not enough to recover for Sutton, making the fight a no-contest. Bantamweight Jordan Collins came out fast and fired off a quick cross that immediately caught Dillon Tolbert's attention. Tolbert then pressed Collins into the cage, secured a takedown and fought off a serious guillotine attempt from Collins. Collins then reversed position and ended up on top in Tolbert's guard. The fight went back to the feet for only a moment before Collins took Tolbert to the mat. Despite Tolbert's best efforts to return to his feet, Collins stayed all over him landing strikes from many positions to close out the first round. Collins took the fight back down to the canvas early in the second round, pinning Tolbert against the cage, and landing constant offense. After taking the back of Tolbert and attempting a choke, Collins lost position and Tolbert ended up back on top, and even took the back of Collins. Collins turned out of the bad position and ended right back up in guard, quickly moving to half guard and continuing to land ground and pound. Collins then moved to a modified crucifix position in side control, while having Tolbert pinned against the cage. From here Jordan Collins unloaded elbows until referee stoppage, making him the winner by TKO in the second round winning his professional debut. Kicking off the main portion of the card, Mimi Kutzin looking to bring the pressure to Rachel Rivera in a amateur female kickboxing bout. Early on Kutzin was unable to land any offense in the clinch when she did secure the position while Rivera landed some solid kicks to keep her away. In the second round, Rivera made a quick turn and landed a spinning back fist that dropped Kutzin. Kutzin recovered and continued the round, still looking to press. Kutzin would continue the same pressure into the third, landing some kicks and punches, but Rivera just kept answering with great responsive offense, landing the majority of the strikes. After the last bell, Rachel Rivera was declared the winner by unanimous decision. In a middleweight bout, Gary Webster pushed Josh Jesse to the cage early. While Jesse did a great job initially of defending, eventually Webster got the takedown. Jesse did not waste any time off of his back however, he quickly secured a kimura and cranked it deep to earn the submission victory. Brandon Smithley immediately took Shaun Briggs down to begin their fight. Briggs then threatened a tight guillotine in response, but Smithley was able to defend. When Smithley gave some space, Briggs used the cage to attempt an armbar. Once again, Smithley was able to endure. Smithley then flattened Briggs back to the mat and moved to mount. Briggs then turned and gave up his back and Smithley rode accordingly, kept his hooks in, and looked to work a choke. Right as the round was ending Smithley looked to pull an armbar from the position that didn't catch. Briggs stuffed a takedown attempt from Smithley to start the second, but then lost his balance and ended up on his back. Smithley worked to mount once again, moved to a high mount position and landed strikes until he earned the referee stoppage by TKO shortly afterward. Andrea Hawkins and Colette Gille came out and put on a slugfest in the first round of their kickboxing bout. Both ladies, for the duration of the round, were throwing non stop combinations at each other at a relentless pace. The second round was more of the same, with Hawkins landing a well placed inside kick that cause Gille to slip to the mat. When she stood back up, both ladies continued the high output of offense through the rest of the round. Another inside kick from Hawkins took the foot of Gille back out from underneath her in the beginning of the third, but once again, she got up and kept coming forward at Hawkins in response. From the opening bell until the final one, these women put on an absolute show that had the audience on their feet cheering. When the decision was read, Andrea Hawkins was declared the winner by unanimous decision. Jason Gavril landed two heavy right hands to start off his fight against Mike Farris. After some clinch work, Gavril took the fight to the mat, but shortly after Farris was able to get back to his feet. Gavril quickly got the fight back down with another takedown, then secured mount and attempted a leg triangle that lost him the position. After the ensuing scramble Farris secured a takedown of his own in response, only to have Gavril sweep and end up on top as the round ended. Gavril landed another takedown to start the second round, moved to mount, but then got swept by Farris who ended up in his guard. Farris then landed some strikes from top until the round ended. In the opening of the third round, Farris took Gavril back down, staying in Gavril's guard and landing select shots until the last ten seconds of the round when they were stood up. After the judges made their decision, Mike Farris was declared the winner by unanimous decision. 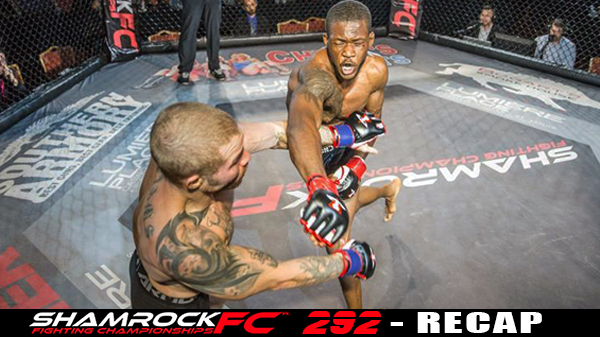 In a gritty match-up of lightweights, Wolves' Den's Aaron Lake used his reach, takedowns, and some moments of ground and pound through the duration of the time to score a unanimous decision over Daniel Williams in a fight where tempers got heated. After narrowly missing the finish in the closing moments of the first round, Chris Budde was able to secure the TKO stoppage over Devin Roach in the second round by ground and pound to start off the evening. 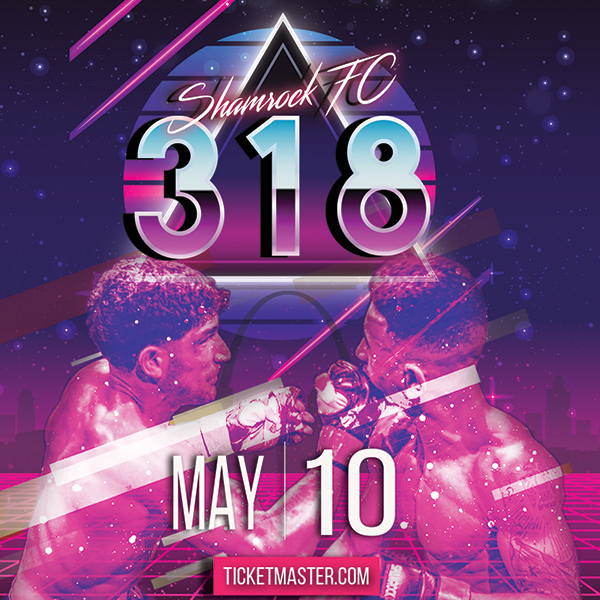 Shamrock FC returns to Lumiere on August 25 for a night of mixed-combat featuring pro boxing and MMA, and amateur kickboxing.